The top priority for the folks at Realvolve is not to simply sell you a CRM, it is to provide a solid foundation for your business and yes for your life, not only with the CRM, but with what is maybe the best educational content in the industry. I have never seen another Real Estate CRM with a truly active thriving Facebook Community until this one. The amount of ongoing contributions from the users and the people at Realvolve is another leg of this educational philosophy. To Realvolve, it’s all about nurturing you to help you become the best agent and the best person, you can be. If you like cutting edge – this is it. The look, the feel, the workflows, the rFactor, propinquity and analytics to suggest follow-ups and more. This is one very impressive piece of software. If you’re searching for the CRM that has the best “Workflows” capability, which are also known as Activity Plans, Action Plans, or Campaigns in other CRMs, then this one should be on your short list. As a matter of fact, Mark Stepp (see History at end of review) excelled at workflows (called Task Series) in Advantage Xi. They were the Best in Class. Now that it’s web based he has surpassed himself in this feature. Realvolve now gets Best in Class overall for it’s work flows feature. The Salesforce based Real Estate CRMs do have more powerful workflows as far as options go, but Realvolve is much easier to learn and use, and will suit the vast majority of people. It also has an important dates checklist that is customizable. On another note – it sends SMS/Text messages and adds them to the radar (history). They recently released their iPhone app and the Droid isn’t far behind. FULL DISCLOSURE – I wasn’t kidding when I said I REALLY liked this one. 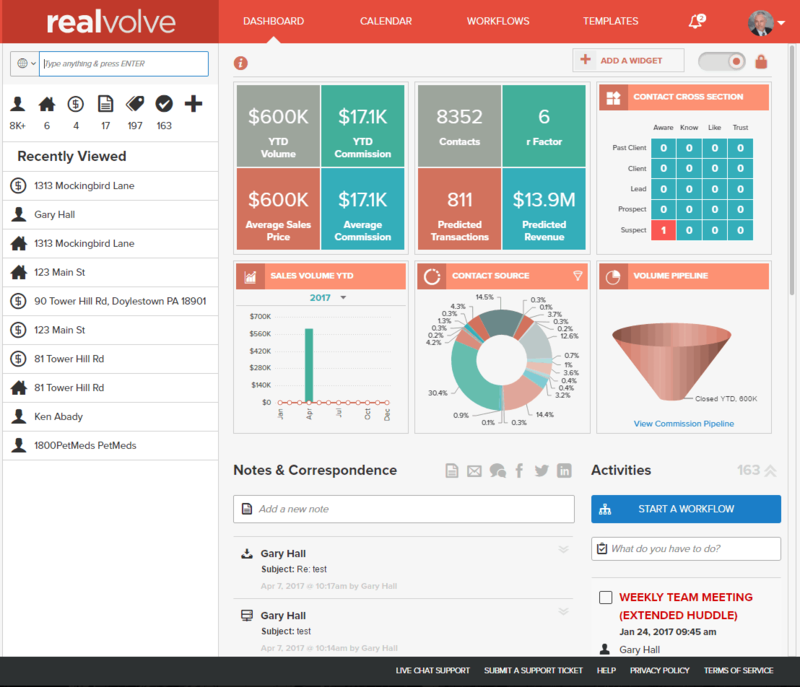 As of 12/1/2015 I have joined Realvolve as the VP of Customer Success. After 25+ years of using, selling and implementing over 50 Real Estate CRMs, this is the first one I couldn’t help but join when I was offered the position. It simply intrigues me more than any other and I see more potential in it than I have ever seen before. Mark Stepp(Advantage Xi) is a big part of the reason. There is still no one best CRM, but if there was, this would be in the top two or three (in my biased, but very experienced, opinion :)). I will be transitioning from my business here to Realvolve over the next several months. The CRM providers on my site have graciously agreed to allow me to continue to sell their products as I always have because they know I am always fair. The only difference now is that I can’t say I am totally unbiased. But those of you who know me, know that if I don’t think Realvolve is right for you, I’ll tell you. Updates & Fixes: Click here for a list of them. Handy little tool. Have you used this CRM? Rate it – but please be professional. Thanks! Clean! Just really crisp and clean and such an efficient layout. I’m sorry but I’m going to have to gush about this one. The whole flow is just different than any other CRM I’ve seen and it’s really efficient. And yes in this case different is a good thing. When you first look at Realvolve, it seems like there is not enough there. Like things are missing. But not only is it not missing anything, but it’s got some goodies no one else has. Note the Search Anything box. You can key in anything you want and it will find it almost anywhere in the program. The vast majority of Real Estate CRMs do not have this feature. Note the Recently Viewed on the left. This is one of my favorite CRM features and surprisingly it is not in most Real Estate CRMs. This is not just marketing. I just attended their webinar (9/29/2015) showing how this works and it is a much needed evolution in CRM. We’ve been gathering all this data on our contacts/clients for years. It has served us well in doing some target marketing and follow-up but what other uses have we put it to? Realvolve is now making use of it! If you record lunch appointments with Joe Client, and emails and you have a lot of notes and on and on… This uses all this information to give you valuable insights into not just that single contact but your whole database. One of the things it does is evaluate your relationship with someone and then it will remind you to call them based on a compilation of all the information available on the person. This is not the place to get into too much detail but I am here to tell you that this is nothing short of revolutionary in the industry. Very Cool! ♥Workflows/Activity Plans – Best in Class! Advantage Xi has far and away the most powerful workflows (it calls them Task Series) of any CRM I have ever seen, with the possible exception of Salesforce. That said, using Workflows in Salesforce requires far more patience and practice than Realvolve. I’m going to let the pictures do the talking. Realvolve has several features to it that no one else does. One is that Tags are incorporated into them. 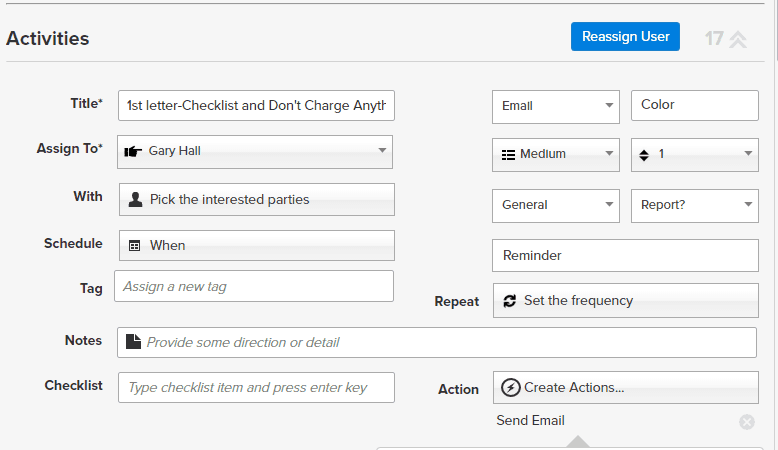 Another is that you can create a list within the task and set options as to the completion of the list. The more you dig the more options you find. It has the most powerful Workflows in the industry and teams are loving it for it’s scalability. 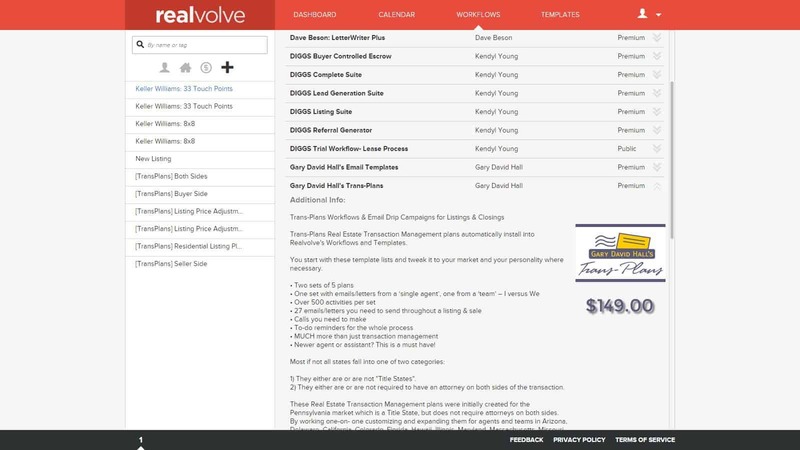 Content Library – Realvolve has a number of Workflows included such as the Keller Williams 33 Touch Points and 8 X 8, as well as the “Client Services Workflows which is comprised of 13 commonly used ones such as a Closing when it’s your buyer or your seller or when you have both sides as well as a Listing Workflow and many others. Additionally, you may purchase one of a large number of workflows and templates from the likes of Dave Beson or Gwen Daubenmeyer. All the products can simply be turned on for use when purchased because they are already formatted and installed by Realvolve. They plan to continue to add choices for content here. ♥Calendar – Best in Class! The power and flexibility of the activities in Realvolve are going to knock your socks off! Realvolve knows how some of you are seriously organized and have become dependent upon color coding on your calendar because Outlook has had it forever. So they have it. This is where many agents eyes will glaze over and they’ll lose interest. But some of you are going to start salivating. This is one of the times that Mark’s extensive background in Real Estate CRMs shines. Look at the Activity image. There are several unique features in it. One is that a single activity can actually include a Checklist. So you can partially complete a checklist and have it come up a pre-determined number of days later. Look at the Create Actions field. All other CRMs have the regular trigger dates for activities. Listing Date, Expiration Date, Contract Date, Closing Date, etc. Realvolve has so many more of them that I am not going to bother listing them all. It also has a Send a Message area. Many CRMs have this. This is what allows you to schedule an email to go out or a letter to print. ♥Importing Data – Best in Class – Importing is not really all that difficult if you have done it before. But most have not done it before so it can be very intimidating. Mapping fields is not too difficult either but the same applies. So it sure would be nice if the CRM you are moving to has already done all the mapping for you. Realvolve does that for 22 of the most popular CRMs including Advantage Xi, Agent Office, By Referral Only, Cloud Contacts, Insightly, IXACT Contact, Outlook, Top Producer and WiseAgent. So that means if you have any of those programs now, Realvove has made it as easy as possible to get your data in. ♥Email storage: Best in Class – This is a perfect example of why I am so excited about the potential of Realvolve. Mark Stepp knows what you want and this is one of the things you want! You can have a client with whom you have done several transactions over the years. You really want to store any email relevant to those transaction. Having it all stored with the contact is far better than not having it in your CRM at all, but it’s not optimal. While the emails are relevant to the contact, they are far more relevant to the transaction. Storing the emails relevant to a property or transaction with the contact means eventually you have one heck of a lot of emails to sift through to see which ones are relevant to the transaction. So why don’t all the CRMs allow you to store the email with the transaction itself? Because they don’t get it. They’re in the process of getting it. Mark has known this for a long time which is why you could do that in his old CRM Advantage Xi. The other CRMs have it half way there. They give you a coded email address that enables storage with the contact. Realvolve has taken it to the next level. They allow you to create a coded email address for contacts, but also have them for properties and transactions, and they are planning to make it even more versatile. You will also be able to do things like add a note to a contact or create a task, using just email, down the road. Look to the right of the property address at the top and you’ll see an “i” icon. Because I am hovering over it, it displays the email address specific to that transaction. Clicking on it copies it to the clipboard. In the next shot you see the email I sent where it is stored in the Notes & Correspondence. ♥Relationships: Best in Class – Yet another problem virtually always overlooked in CRMs – but not Realvolve! How do you communicate with a couple, such that when an email is sent, it is sent to both contacts at their respective email addresses? Below the Connections section is the Personal Details where you can store some important data about the contact. By clicking on the ( + ) plus sign to the right of Relationship status, the system will allow you to connect the spouse or significant other. Choose the relationship type and then Enter the name of the contact. If they are in the database already, you can select the contact or you can just press TAB to leave the field and it will automatically add the contact’s name into a new contact record and link the two contacts. The Greeting and Mailing name fields are used when sending letters and labels to the joint records. Greeting would be “John & Mary” where the Mailing name will be “John & Mary Smith”. The option to make the current contact the primary will change the order in which those fields are displayed. Below the input fields for this section is a set of check boxes to keep Home Address, Home Phone, Kids and Tags the same on both contacts, select those as desired. Outstanding! Zapier Interface – If you’ve never heard of Zapier you should check it out. If your CRM program is set up for Zapier, it allows you to connect hundreds of different apps to it. Things like all the Google apps, Social Media, WordPress, etc. This will undoubtedly be a standard in the industry for Real Estate CRMs at some point, but Realvolve is one of the few that already does it. It has the API Key (required to use Zapier) readily available in the settings section in Zapier, or in the My Account section. An example of what it can do for you. How about having a Google Form on your Tablet for your Open House visitors. They fill out the form and they are automatically added to your Realvolve database and started on a follow-up workflow, all automatically. They’ll get a follow-up before they leave the house! Evernote Interface – If you’ve never heard of Evernote, you really need to get out more. If you have, and you use it, Realvolve is already set up to interact with it. Niiiice! Trans-Plans Activity Plans: Realvolve has formatted Trans-Plans such that all the plans/emails/letters install automatically. All you have to do is start using them! How does Realvolve stack up with other popular features? Phone/tablet: Google sync to phone. A mobile User Interface is on it’s way. Lead Capture: As with all of the better CRMs now, Realvolve uses email parsing to accept and auto-populate leads from virtually any source. Email Storage: Best in Class – Covered in Unique or Notable Features above. Realvolve is the logical evolution for Mark Stepp, the creator of Advantage Xi. Advantage Xi is a desktop CRM and moving to the web was only a matter of time. I used Advantage Xi for about five years and loved it. It had its issues because it was desktop based but it is an incredibly well thought out CRM. It is still the strongest CRM on the market in a database context. Mark is the CIO and one of four primary players in Realvolve and if it evolves to be even close to the power of Advantage Xi it will be a huge success. Now here is a kicker. I have followed Real Estate CRMs since the very first one called Howard & Friends that came out in 1982. I have seen them all come out and so far 10, 11, 12, 13, 14, 15 of them go out of business. This is only the second time in well over 40 CRMs that I have seen someone involved with their second CRM in this industry. Bruce Peterson was the primary developer of Agent Online(Agent Office) back in 1992. He and Jim Lawson got together and created Agent 360. When you develop a CRM you never know exactly everything that needs to be in it. You have to launch a new CRM knowing that for the next few years and beyond, you will be listening to your user’s feedback to make it a better product. But in this case, Mark has been listening to your needs for twenty years already. That is a huge leg up on the competition, and a huge benefit to you. Do a screen sharing session with me and see this product or any others in which you may be interested. All accounts have the use of one account for an assistant. 14 Day Free trial. No credit Card required for Trial! Pro – $49/59/mo. per agent user. Pro+ – $167/199 for up to 5 users. Team – $233/280/mo. for up to 10 users. Large Team – Call them. Have a question? Click here and ask away! AddressTwo has all the common features that are core to all CRMs such as the ability to track names and addresses, phone numbers, email addresses, web site addresses, etc., but the Professional edition goes well beyond that and includes email storage with contact records. The terminology for the field labels and the general flow are not what you would expect in a real estate CRM, but that’s not what it is, so it should be no surprise. That said, it is laid out well with lots of handy little icons all over the place to enable you to quickly get around. It really does have a lot of features that you might not expect at first glance, as you can see below. AddressTwo is a fairly basic looking dashboard but it’s pretty darn functional. I’ve personally grown to like a list of appointments as opposed to an actual calendar view although the calendar view is also available. There is also a button that leads directly to the Google calendar. Additionally, I like that Recent Website Leads is right in your face on the dashboard. You also have your current tasks and projects. And then there’s Addy (pictured in the image below). Addy takes a number of the functions within AddressTwo and kind of personifies them. Addy is the one who brings in your new leads, stores your email and reminds you about different things. Phone/Tablet – As all of the good CRMs are now doing, AddressTwo has a different User Interface specifically designed for use on your phone vs on your desktop. You don’t have to be tied down to your desk to stay organized! This is one of the more basic UI’s out there, but it’s still much better than what historically has been access only to your address book and calendar. Social Media – Linked to LinkedIn, Twitter and Facebook. Team Capabilities – AddressTwo has one of the better set ups for permissions for users. Five permission levels go from being able to see everything to production which can only see those projects in which the person is involved. Real Estate Plug-in – Following are screen shots of what is added when you get the AddressTwo real estate plug-in. It’s very basic information but it may satisfy your needs. Also note that you can search for buyers with the info you put in. Custom Fields – A rare feature for such a relatively basic CRM is the very handy ability to add custom fields. If you do primarily residential resales but dabble in a few other things here and there, you could add the fields you need to accommodate that business. How does AddressTwo stack up with other popular features? Lead capture: Although AddressTwo is not specific to real estate, they do provide the ability to automatically add leads by using a contact form which can be generated from within the CRM. Note that because it is not a real estate CRM, the contact form contains no fields specific to real estate. There is a point at which you can modify the field labels so there is some flexibility there. New lead display: Right on the dashboard where it should be! 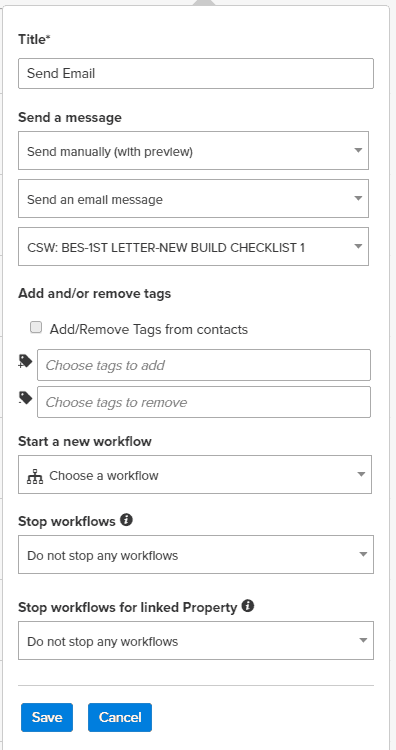 Lead notification: You do have the ability to be automatically notified from AddressTwo by email when a new lead completes the contact form. Buyer home search: There are minimal number of fields for buyer preferences but it does have the capabilities to both store and search on them. E-mail stored with contact record: Another feature that is included for such a low cost. Included template content: None. They have the ability for you to create email templates but you have to create them yourself as this is not specific to real estate. If you’re on the fence about it, don’t be bashful. I’ll be happy to do a live online screen sharing demo to show you some of the great features of this CRM. AddressTwo is the success story of a man by the name of Nick Carter who identified a need for a simple CRM and ran with it. It worked so well it prompted him to write a book about building a start-up without outside funding. That was in 2008 and AddressTwo has been growing ever since. Although AddressTwo was created for use by anyone, as opposed to specifically for real estate agents, it’s real estate version does have a few things added for agents. They don’t market this version but I go back a long way with AddressTwo so I am aware of it. That said, they have a new version coming soon and it may or may not include the real estate modules. Unless that’s a key issue for you, it will be even better. This is a direct link to their site to a page created for me. No promo code is necessary to ensure any special deals provided here.